So awesome! The hours I spent poring over the bibles as I scraped up the money to buy each in turn..
Just curious, (the website didn`t make it clear...) other than the June 4th and 10th screenings at SIFF, will there be other opportunities to see this? His Cascade Alpine Guide guidebooks are pure genius - by far the best guidebooks I've ever seen here or in Europe. His study and knowledge of history and geology puts him on a different plane. I love the history. I've spent a lot of time going over the footnotes and spin off historical reading from those, particularly the N Casc and Canada, VIII. And let's not forget the geological footnotes too. There is a vast depth to these books far beyond climbing alone. In fact while writing this post an interesting parallel springs to mind from the world of astronomy. Robert Burnham Jr was born in 1932 and was the prototypical single minded loner with an obsession, in this case, the stars. He never married, never had a formal education, yet with persistence he put his intelligence to work and parlayed his obsession into a job as an observational astronomer and equipment wrangler at Lowell Observatory. Over his decades there patiently and meticulously doing a photographic sky survey, plate by glass plate, of the norther hemisphere sky, he also was hand writing a set of three handbooks for amateur use. He finally managed to get them published and they were instantly launched into classic, must have status. Like Beckey's bibles, this three volume set was renowned for it's detail, intimate knowledge, and depth of subject material including extensive background....history, literature both modern and ancient, paintings and drawings, even coins. A single entry on a prominent star, or the Milky Way for that matter, can contain 5-10 pages of background like snippets of poetry, including from China, mythology, explorers and scientists comments, etc. I have never seen another reference work of this sort in any other science, like Beckey's bibles, I can read and reread the several thousand pages at random and stay entertained all over again. Also like Beckey, in spite of the unparalleled success of his three volume reference work, he didn't parlay this success into much else. He died destitute. Years before he was a destitute painter, Robert Burnham Jr. had inscribed the universe. 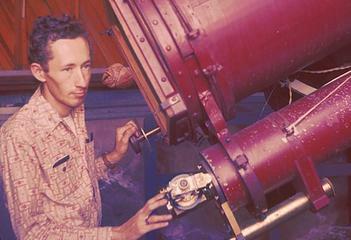 Writer, astronomer, finder of comets and asteroids and collector of ancient artifacts, Burnham was a singular Arizonan. He was a scientist whose work at Lowell Observatory in Flagstaff helped advance the understanding of the sun’s neighborhood in space. He was an author whose name has become so familiar to some readers it has become a sort of shorthand, like Audubon to birders, Hoyle to card players, Webster to poor spellers, Robert to parliamentarians [like Beckey to climbers]. 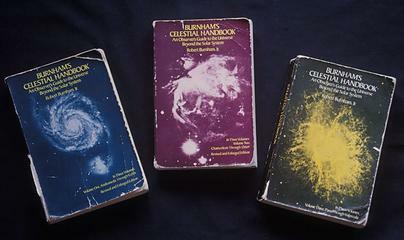 More than 30 years after its first publication, Burnham’s Celestial Handbook: An Observer’s Guide to the Universe Beyond the Solar System remains a sort of real-life hitchhiker’s guide to the galaxy, a compendium with something to say about nearly every cosmic destination worth visiting. Part travel guide, part history text, part encyclopedia, it’s like a handheld natural-history museum of the universe. And for decades it’s held a grip on the imaginations of most people who ply the night skies with telescopes, people who yearn to travel in space and know that they can, any dark and clear night. Reading Burnham’s massive, three-volume work is like reading the notes of an adventurer who has spent a lifetime studying the treasures of a lost civilization: Its 2,138 pages are loaded with tables of data, technical passages and illustrations interspersed with historical arcana and ancient poetry. And all of it is meant as an incentive for the reader to recover those treasures by merely looking upward. It is rarely compared to other books because there simply is none other like it. No other popular work approaches its utility and completeness; few other scientific texts contain its sense of wonder and even spirituality. Are the showings in Seattle already sold out? The website says they plan to take the movie on tour in 2017 and 2018 to as many cities and festivals as possible. Apparently there is no schedule as of yet. It would be cool if they could have a showing at the Admiral Theater in Bremerton. I called SIFF and they said both screenings in Seattle are on standby which means there are not selling any more advanced tickets. They said some tickets may be available at the box office ten minutes before the showings. 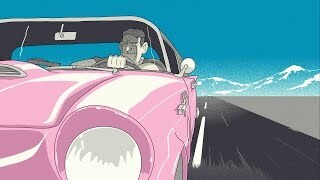 There was a long, very well publicized, effort on Kickstarter about a year+ ago; the producers had a 10 minute version and wanted donations to make a full length version. The upcoming screenings are the result. And, those who donated are supposed to receive a DVD copy... "late 2017 or early2018". So, there should be plenty of opportunities to view the full edition. I donated to the Kickstarter so you're welcome to come over to my place for a showing once I get my copy. In fact, anybody in the West Sound area would be welcome to come over. We can have a showing. PS, if you missed Los Lobos at the Admiral last week you missed a fantastic show. I am interested in seeing the movie. Please let me know when you get something set up. 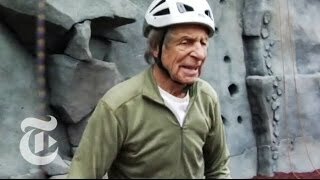 I will bring my copy of Fred's "Climber's Guide to the Cascade and Olympic Mountains". "Some people may think that it's an adventure to go on a cruise ship in the Mediterranean. To me it's no adventure at all unless someone bombs the ship."